*A 10% restocking fee will be applied to all returned hair systems. Returned hair systems that have been altered (such as hair cut or base cut down) are subject to a 35% restocking fee. We cannot accept any returns on hair systems that have been worn. The HN PRESIDENT model is a great ALL THIN SKIN POLYURETHANE bonding or grafting system(although many use tape and perimeter attachments). We start with the same specifications of our other models-6” hair length overall, light density (for the most natural hair density appearance) and the PRESIDENT can be cut down to the smallest of sizes and is great for frontals and Spot Alopecia applications. 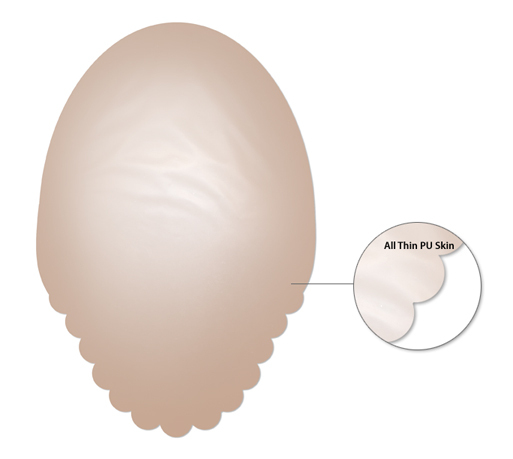 The base design is a Thin Skin Polyurethane system with a Scalloped Front Hairline for a natural look and the thin skin allows for a seamless transition from the system to the natural growing hair. The first 1/4” of the President offers looped hair NO KNOTS for the most natural frontal appearance. Base size 8" X 10" if you need the old base size, please indicate in comments and we will cut down the base at No Charge to the 7-1/2" X 9-1/2" size ONLY. Base Size 8" X 10"
I have a been a client for several years now and I have alway been more then pleased with the product. It feels and looks like my own hair and gives me confidence to always look my best. Happy to see your stock of the president base hopefully increase number 7 color anyways@! !They just feel lighter to wear and adhear to shinny the best@! ;p Without a doubt your service price product, cannot be beat@!!!Anywhere!! ThankyaKindly!! Happy New Years@@!! The system was fantastic. Easy to shape and looks fantastic. Will reorder this product soon. Truly a quality unit. I have paid up to 4 times as much for this quality. the secret is in the cut and the color. Make sure you carefully match the color to your own hair and then have it professionally cut by Hair Necessities. The website is second to NONE in userfriendliness and ease. They are also avaialble to serve simply by picking up a phone and calling. THANK YOU Hair Necessities! Wears well. Looks natural. I use tape and replace every two weeks. I have used this system for a number of years. I lead an active lifestyle, skiing, swimming and golf and this unit has never failed. Use the white glue if you can as it will last up to 4-6 weeks of bonding. These people seem to stand behind their product and I would highly recommend both the unit and the company. I HAVE THE PRESIDENT POLY HAIRPIECE AND IT'S A REAL LOOKING PIECE AND YOU CAN CUT IT USING YOUR OWN HAIRPIECE (IF U HAVE ONE) TO FIT THE SIZE OF YOUR SCALP. JUST TURN THE HAIRPIECE U HAVE NOW INSIDE OUT AND PLACE THE PRESIDENT ON TOP TO OUTLINE AND CUT---BE SURE YOU LEAVE THE SCALLOPED FRONT INTACT--THIS GIVES A REAL LOOK. THE HAIRPIECE IS VERY LIGHT AND EXTREMELY COMFORTABLE. MINE IS A STOCK PIECE(LESS EXPENSIVE). YOU DO HAVE TO BE CAREFUL AS IT IS THIN HOWEVER IT LAST. THE PERSONNEL ARE ALWAYS THERE IF YOU HAVE QUESTION AND THEY DO ANSWER YOUR QUESTION. Click the button below to add the President to your wish list.